Bizarre parosteal osteochondromatous proliferation (BPOP), or Nora’s lesion, is an unusual surface-based lesion of bone found most commonly in the hands and feet. In the original description of the lesion and in all publications that followed, one of the key imaging characteristics used to define this entity was the lack of cortico-medullary continuity with the underlying bone. 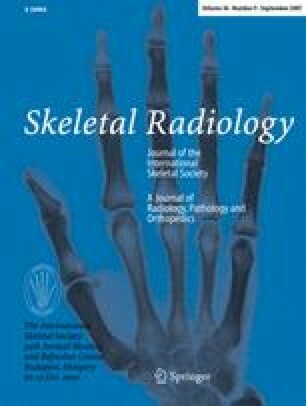 The authors present 4 unique cases of pathologically proven BPOP in which cortico-medullary continuity with the underlying bone was demonstrated on imaging. It is believed that florid reactive periostitis, BPOP and turret osteochondroma may reflect points along the same continuum with trauma the likely inciting event. The authors suggest that, given this continuum, it may be possible to have BPOP lesions demonstrating overlapping imaging features with osteochondroma. If this is the case, strict adherence to the standard imaging criterion of lack of continuity between the lesion and the underlying bone may lead to misdiagnosis of these unusual cases of BPOP as osteochondromas.